Power, energy and other infrastructure projects are increasing exponentially in Bangladesh. A country requires its infrastructures to be sustainable, capable of catering to the ever-growing demand of power, energy, roads, bridges etc. Infrastructure projects can be undertaken under G2G; PPP (solicited or unsolicited) or non-PPP (solicited or unsolicited) mode of procurement. Legal support is required at the procurement stage. (for additional information please see Procurement, Bidding & Government Contracts). Legal support is also required at different stages of the project, on different issues, for example, drafting various agreements, contracts, subcontracts, MOU, EPC Contracts, O & M Contracts, etc. Legal due diligence before the commencement of work is strongly recommended. Clients often require services for obtaining various consents & permits for subsequent takeover or dispute resolution related services. Mr. Mohammed Forrukh Rahman has been ranked (Band II) for Corporate & Finance. 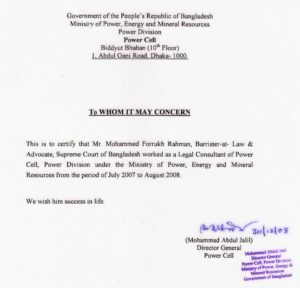 Mr. Mohammed Forrukh Rahman was a legal consultant for Power Cell, Power Division, Ministry of Power, Energy and Mineral Resources for one and a half year from 2007 to 2008. Rahman’s Chambers is one of the leading law firms in providing legal services to power and energy sector for nearly a decade. The Chambers advises both government and government-owned entities for a whole range of their activities and also local and foreign companies engaged in the generation of electricity. 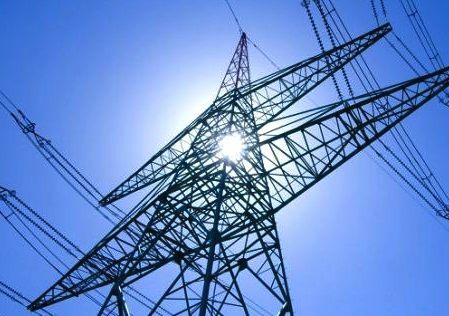 The Chambers expertise covers all legal aspects of power including generation, transmission and distribution and so on. His association with the Ministry of power has exposed him to issues pertaining to power projects and general corporate laws. Acted as a lead counsel for Unitex LP Gas Limited involving design, supply of equipment, project management, supervision, erection and commissioning of liquefied petroleum gas (LPG) terminal plant and bottling facilities at Chittagong. We advised clients from the very inception of the project starting with project due diligence, framework agreement, EPC and other related contract draftings. Provided legal consultancy to a Bangladeshi leading group of companies jointly working with a Korean company on a maritime distress & navigational system project. Advised POWERCHINA Resources LTD. on implementation, legal due diligence, land acquisition, etc. for a 350 MW coal based power plant. Advised Electricity Generation Company of Bangladesh (EGCB) Ltd. on drafting several agreements for operation and maintenance (O & M) of 210 MW Siddhirganj thermal power station. Advised and also appeared as a counsel for a major power sector at different forums including arbitral tribunal, high court & lower court involving failure to ensure dependable & contractual capacity and associated liquidated damages involving a 105 MW diesel-fired plant at Bheramara, Kustia and a 105 MW furnace oil-fired plant at Noapara, Kustia. We have advised Union Resources & Engineering Company Limited (UREC) (Bangladesh Liaison Office) on 1320 MW coal-fired Power plant project at Matarbari, Cox’s Bazar in preparing several project proposal, e.g., MOU, JV & setting up Company as SPV. Legal due diligence and consultancy on a PPP based major 1320 (2 x 660) MW coal-fired power project at Rampal between National Thermal Power Corporation (NTPC) and Bangladesh Power Development Board (BPDB). 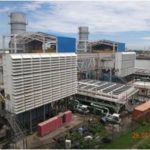 Takeover & due diligence of 450 MW gas-fired combined cycle power plant from AES Meghnaghat Ltd and a 360 MW combined cycle gas turbine power plant from AES Haripur Ltd to a Malaysian group of companies. 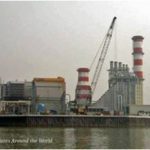 Resolution of Dispute between Power Division and Harbin Power Engineering Company Limited on 100 MW Simple Cycle Gas Turbine Power Plant involving execution of contract and return of Bank Guarantee. Legal consultant on an international Arbitration between Smith Co Gen. (BD) Ltd vs. BPDB and GOB on the execution of foreign award passed by an arbitral tribunal constituted under ICC rules involving failure to get consent and approval for power project & failure to arrange plant, financial closing, etc. Successfully handled Writ petition 3512/2009- Energy Prima Limited vs. BPDB, relating to a power plant contracted on a rental basis, where complex claims over customs exemption as per Implementation Agreement, rights and liabilities arising out of force majeure, delay, liquidated damages etc. under PPA are litigated. Drafting Memorandum of Association & Article of Association of South Zone and Central Zone Power Distribution Company Limited. Legal due diligence to Velcan Energy Ltd a solar power company on a solar power project in Bangladesh. The due diligence involved preparing a legal register summarizing all consents and permits required for establishing infrastructure projects along with time requirements, expenses and related legal provisions. The due diligence process involved searching mortgage and securities created over assets of the power plant, searching the Company register etc. Most infrastructure projects involve signing of several project related agreements, for example, for Power Projects – Power Purchase Agreement (PPA), and for most infrastructure projects – Implementation Agreement (IA), Gas Supply Agreement, Land Lease Agreement, etc. Such agreements are signed with Government, procuring authority and other government agency. legal advice is always required before signing such agreements. For major infrastructure projects, the main contractor tends to delegate few major responsibilities by way of subcontracts and focuses mainly on arranging finance and supervising the overall execution of the project without delay. The subcontracts can be classified as Engineering, Procurement & Commissioning (EPC) and Operation & Maintenance (O & M). However, there may be several other subcontracts for different purposes. Disputes may occur at different stages of the project, before or after signing of the agreement. Disputes which arise before signing contracts are by nature related to procurement issues (more additional details on procurement and bidding, please click here). On the other hand, post-contract signing disputes commonly arise for a delay in financial closing, land procurement, obtaining consents & permits, providing performance guarantee, quality & failure to reach contractual capacity, etc. Legal advice is required at every stage of the project to avoid & resolve disputes. Article: Power Generation in Bangladesh: Legal Issues (Vol. 2 of 2009).